Roll off Trailers are very safe and BENLEE trailers are true work horses when used correctly. Also, competition makes the world a better place. We are flattered how many small competitors have done their best to copy our best selling Super Mini and copy design features of our other trailers. The Super Mini remains a top seller and we continue to thank OmniSource for suggesting we develop it 11 years ago. It is a great roll off truck replacement. 5, yes, FIVE companies have tried to copy it, but none match the BENLEE Super Mini. Also today is sells for about 9 percent more that the original price 11 years ago, despite many, many upgrades! BENLEE has been operating in MI for 43 years. Literally about 98% of all 6 and 7 axle trailers on the road today were built by BENLEE/DUNRIGHT. 98% is a big number. The reason is while BENLEE is not perfect, Bill Wolok founded and built a great company and then my team and I (many still on the team that Bill hired) made it a better company and have made more that 40 upgrades to our BENLEE roll off trailers in the last 12 years since Bill sold me the company. I am writing, due to a new term has made it into our lives. Fake News. I will now use that term. Earlier today, we were made aware of a small competitor that sent out information that had fake news that could also be a major safety issue. 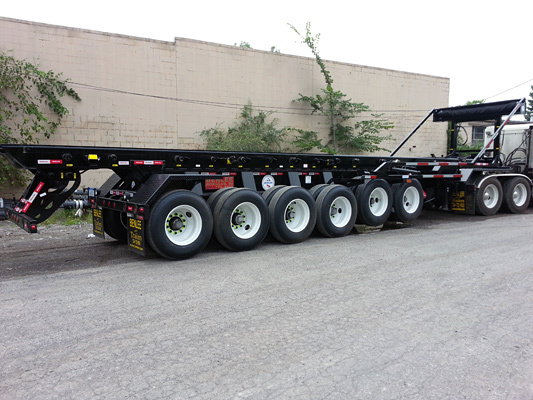 “This customer is able to get the same legal payload as a 43′ 6-Axle “Conventional” Roll off Trailer”. In Michigan GVW is calculated as 15,000 for the tractor steer, 16,000 for each of the tandem drive axles on tractor, and 13,000 for each trailer axle. 4 axle is 15,000+16000+16000+13000+13000+13000+13000=99,000 GVW. We will also add that the competitor’s email tells of a very scary thought, which again is not even legal. Picking up a load of 70,120 and a 6,000 lb. box, so about 76,120 as well as part of the weight of a trailer, so say 9,000, meaning total of 85,120 lbs. on two axles and one single point suspension is a sure way to cause a very serious issue. Bottom line is a company wrote today that their 4 axle trailer can carry what a BENLEE 6 axle can carry. That is not only Fake News, it is dangerous.